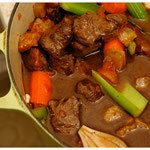 The Provencale version of beef stew differs slightly more genteel cousin, Boeuf Bourgignon, primarily in that the meat should come from a bull not a cow. 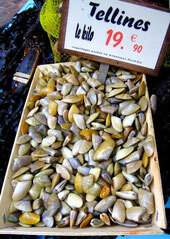 This is the meat for which the Camargue is justly famous. 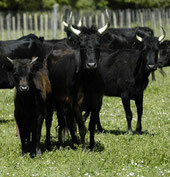 While the Camargue bulls have become smaller over the years in pursuit of more tender meat, it is still a stronger meat both in texture and taste than its sisterly version. 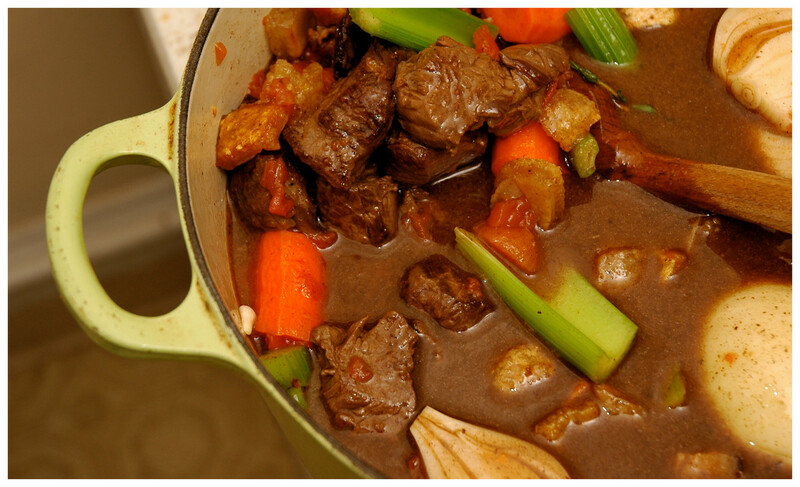 While any beef stew will benefit from an initial marinating, it is essential for bull beef. The other main differences are the wine, of course and some of the other things that are put in as well. The whole thing should take a considerable amount of time to do. The meat and the vegetables need a 24 hour marinating. Also like all stews, it will benefit immensely from being made in advance, preferably the day or two before, letting go cold and gentle re-heating before consumption. Like a person, a good stew needs time to grow up. If, when you buy the meat, you ask the butcher to cut it up for you, make sure he does it properly. 1 1/2in cubes (3cm) are usually about right. I prefer them a bit bigger as I don’t like them to lose all their texture after long cooking. Smaller is a mistake. You should also supervise the amount of fat that is trimmed off. Smith dislikes fat but a modicum is important for the state of the stew. All this is important because the meat will not be cheap. It is better to cut it up yourself. That way you get it as you want it and your greyhound can get the bits you don’t keep. 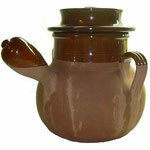 A note on pots: The stew should not dry out. It should be cooked as gently as possible in a pot that should (a) not make the outsides and bottom of the stew too hot in relation to the rest and (b) should limit evaporation as nearly airtight as practical. 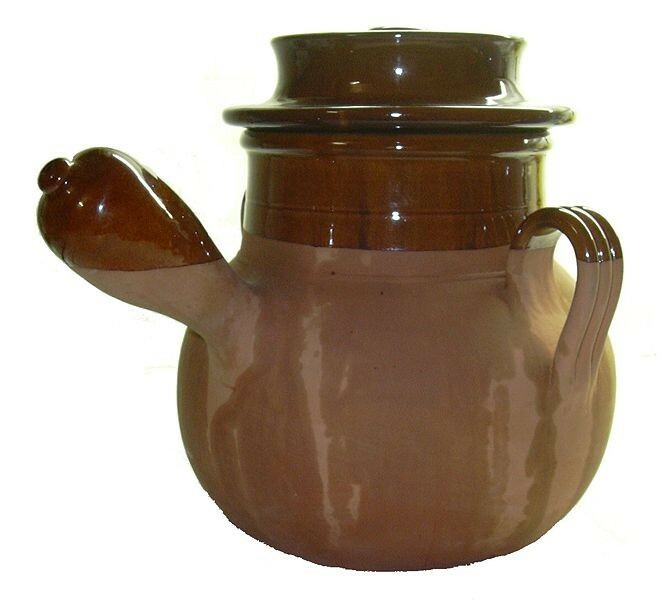 If you are very fortunate you will have access to a daubière which being a piece of pottery prevents (a) and is of a shape that limits (b). If you do not have one of these, (most people don’t) and are using a Creuset-type casserole than a good tip it to lay a piece of slightly dampened baking parchment over the stew during cooking. Timings: Preparation and marinating 24 hours, cooking approx. 3 hours, resting time 12/18 hours, reheating time 1 hour, Eating time 60 minutes +. 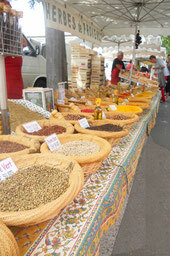 The tradition is to eat the stew with rice, another product for which the Camargue is well-known or with pasta. Smith prefers simply boiled potatoes. Making a good daube demonstrates better than almost anything else the important lesson to be learned about living in Provence - nothing of value can be hurried. · 1/4 cup chopped fresh parsley - if you like parsley. Make up the bouquet garni in cheesecloth and tie up securely. Put the celery, onions, garlic, carrots, beef, bacon in a large frying pan and gently sautée them in a little olive oil until they become a little soft. Add the wine and cognac and bouquet garni and bring everything to a gentle simmer. Let it reduce gently for about 10 minutes. Do NOT boil vigorously. Take it off the stove and let go completely cold. Put in a large ceramic or plastic bowl. and add the beef. Stir it all gently until everything is covered and refrigerate it for 12 to 24 hours. It is a good idea to turn the whole thing over from time to time to make sure the marinade is reaching everything. Pre-heat the oven to 350 F. (175 C) Remove the beef from the vegetables and allow it to drain onto clean kitchen towels. Reserve the vegetable mixture. Heat the oil in a large frying pan over medium-high heat. Toss the beef with the flour and brown it in the hot oil. Remove the beef from the pan and de-glaze the pan with the beef stock and tomato paste, scraping up the browned bits from the bottom of the pan. Combine the beef, pan sauce, olives, salt, and the vegetable-wine mixture in a large ovenproof dish and cover. Cook the stew at 325 F (160 C) for about an hour then reduce the temperature to 250 F (120 C) and cook for and additional 3-4 hours until the meat is as you want it. Then you have a choice. A. 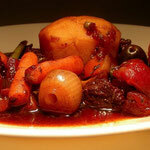 If you are going to eat the stew immediately then cook for 3 to 4 hours, until the beef is tender. Check to see if there is too much liquid in the pan after about 2 hours into the cooking time. If you want a thicker stew, remove the lid for the remainder of the cooking time. B. If you are going to let the stew go cold and rest overnight prior to reheating and eating then bear in mind that the stew will continue to cook a little after you take it out of the oven (especially if you are using a heavy enamel-type pot which retains the heat). It will also cook a little when you re-heat it. Thus you should try to catch it slightly before it is completely cooked. It would be sensible to let the stew rest in a fridge. Smith is not always sensible as he doesn’t like the daube getting too cold. But he also kills people occasionally. Re-heat VERY slowly. You are not trying to cook it all over again. Serve as soon as it gets to the temperature you want to eat it at.